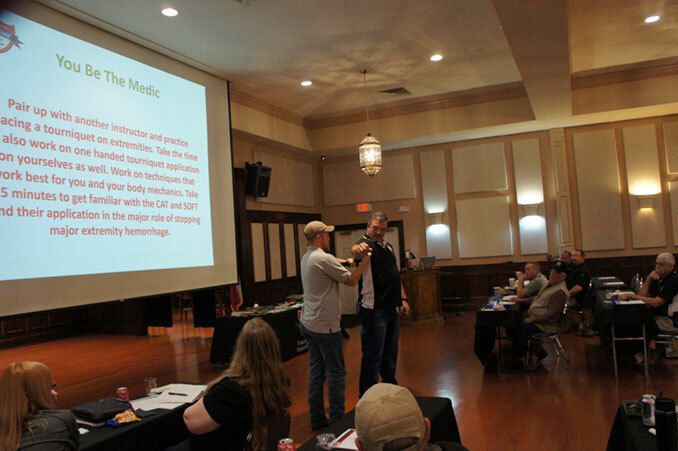 Our Instructors are professionals with years of experience treating these types of injuries on city streets and the battlefield. They have taken the lessons learned from these years of experience and are now teaching them in this course. Our special course was more than 2 years in the making, with the curriculum developed by Rick Hammesfahr, M.D., past chairman of the Curriculum and Examination Board (CEB) for the United States Special Operations Command. Under his guidance, the CEB developed Tactical Medical Emergency protocols and techniques currently being used on the battlefield today. Guests will receive live instruction from one of our gunshot wound first aid instructors, hands-on demonstrations, and course materials that you can take with you. Also, you can now purchase your very own First Aid for Gunshot Wounds Pocket Guide that features step-by-step techniques for treating critical injuries. Click here to get yours today! This is a limited series of events. Register today before seats are sold out. Please enter both your first and last name for your course certificate.